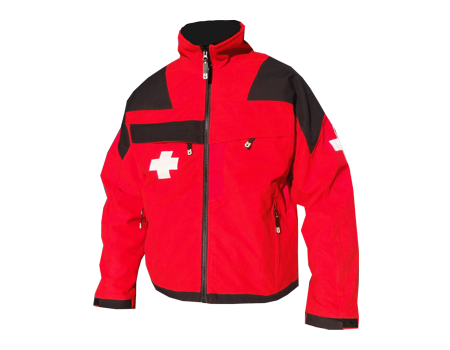 – Waterproof-breathable softshell jackets or vests, with membrane laminate, and stretchy outer face-fabric. Options for nylon overlay. – Windshells – made to be wind and/or water-resistant. Call to specify. Abrasion-resistant overlays optional in heavy wear areas on all. Choose from various fabric weights and linings, depending on uses. We can help you choose fabrics available depending on climate and function. Functions: Design and accents built to match the outer jacket, but streamlined. Exposed, colored, waterproof zips available. Coordinate your image and continue it from year to year. These supplemental matching or layering jackets are less expensive than the outer jacket, and worn more – so replacement costs are less overall. Re-order additions or replacements in your same style season after season. Jackets are standard with adjustable shock cord at bottom. Ample pocket options including convenient fore-arm pocket, front hand-warmer and/or chest pockets. Ventilation zips under arms with mesh are optional. Name-tag/badge tab attachment options. Your logo / patches embroidered and taped in production with large orders. Reflective options available. Lining: Available with breathable mesh lining, 210T sleeves for warmth and movement. Also available with no lining, exposing micro-fleece backing (inside). Other lining options available. Colors: Choose your own color combination to create your own look for group buys. Add piping, reflective options and other features for orders of 50 or more – call for details. Customize: Color your own panels with smaller orders, customize other features with larger orders. Popular custom options are – choose your own length, nametag configuration, pocket specification, piping or accent options. Call for details. Item shown are as customized by Customer.